The maple trees in my yard have been confused this year; our autumn was so unseasonably warm that they have been reluctant to give up their lovely leaves for the winter. With the recent burst of crisp cool weather the trees have suddenly burst forth in bright colors, losing their leaves in a flurry. It is one of those passing moments in nature that you just want to capture and keep. So, during a recent drive over to Sonoma Valley, I endeavored to do just that. Kenwood Plaza Park sits quietly off the Sonoma Highway on Warm Springs Road. My son and I have stopped there before to enjoy the spacious park and its web-like climbing structure. A giant oak reigns over the park center, surrounded by a diverse population of subjects from the deciduous to the evergreen. 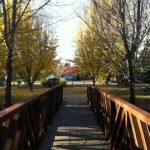 Pathways meander around the park and through the grass, crossing over a bridge that spans a dry creek bed. The surrounding streets are lined with quaint little houses and a pristine white church. It is charming and picturesque at any time of the year but with the splash of autumn color it was especially vibrant and inviting. After playing pirate football on the climbing web we wandered around the paths in the park. The variety of trees created splashes of yellow, orange, green, and red. The intermittent rays of sun peeking through the cloudy sky illuminated the leaves, revealing their delicate details and enhancing the multitude of colors. Wielding a long stick my son batted loose leaves from the branches, watching them fall around him. 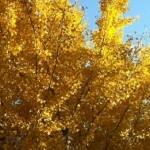 Pools of soft yellow fan-shaped gingko leaves were scatter beneath their trees. 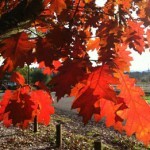 Bright orange and red leaves covered other patches of ground. Before long I found myself collecting specimens, creating a bouquet of shapes and colors. Our preoccupation with the leaves kept us at the park much longer than planned; by the time we left, my hands were full of leaves and my son was loath to part with his now favorite stick so we loaded it all up and took them home. The leaves are now preserved, for a while longer anyway, between two sheets of clear contact paper, hanging on a wall in our kitchen. I am relishing their transient beauty and remembering the perfect time we spent communing with the leaves at Kenwood Plaza Park. Before long the deciduous trees will be bare for the winter so enjoy the final days of strolling amongst the colorful autumnal beauty. You always make your outings sound so special and I know they are. This is a lovely time of year for many reasons.